Wow! I was truly set back by what I was seeing. The quality of the included components was much better than we’re accustomed to, even in games costing three times as much. 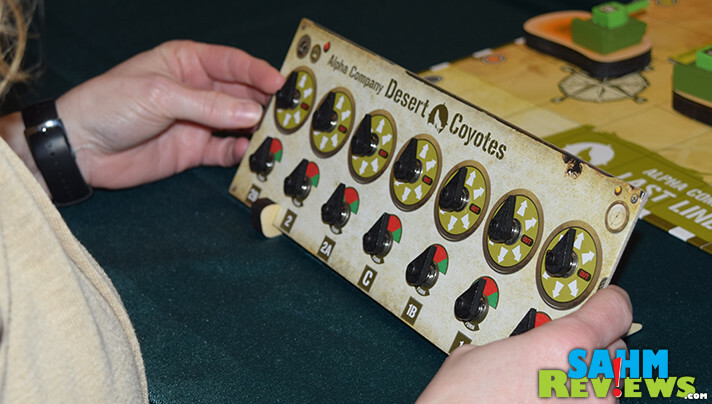 Not only are there color-coded laser-cut wooden pieces, the player control boards with 14 individual dials was obviously hand-assembled. 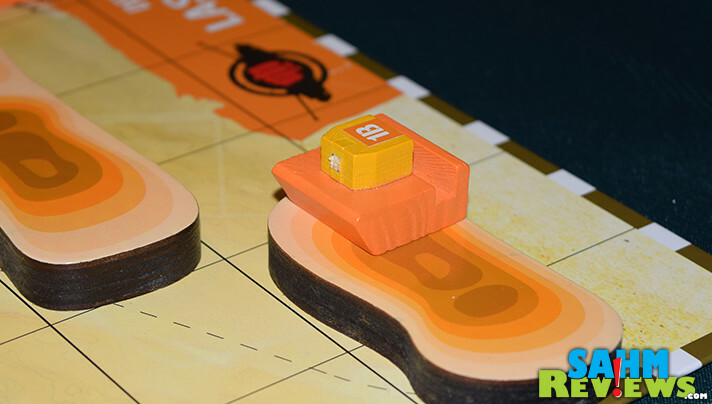 Even in games with gorgeous 3-D play areas like Colt Express, you are the one responsible for assembling the board. Not so in Final Act. Open the box and you’re ready to play! Well almost – there are a few stickers that needed applying. 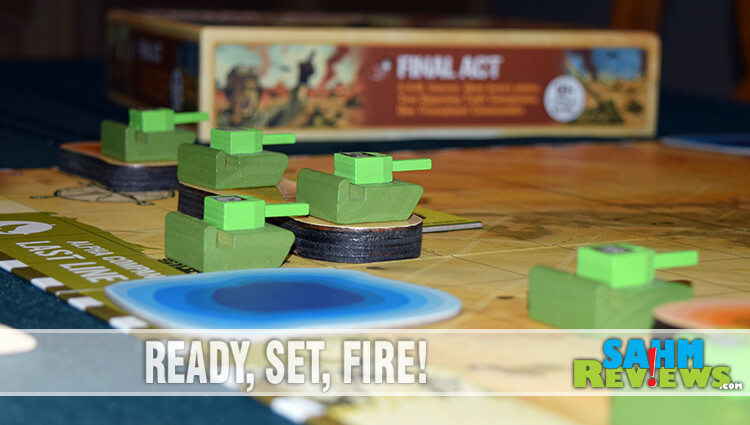 Final Act is a head-to-head 2-player game where each person controls an army of seven tanks. Your goal isn’t to necessarily destroy all of your opponent’s vehicles (although that’s fun too). The first person to get one of their tanks into their enemy’s last line of defense (the last opposite row on the board) wins. Let’s take a quick look at how Final Act is played. Before any play begins, each commander has the opportunity to set of their half of the board in any way they see fit. 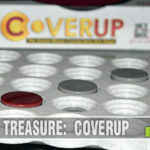 There are swamps, minefields and berms to place, and their positioning is hidden from the opponent by standing the control panels on the center of the board to prevent the opponent from seeing how you are lining things up. 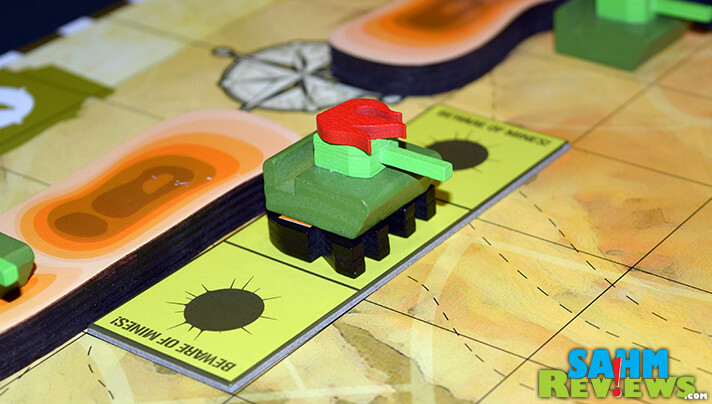 Your tanks are also placed in starting positions anywhere within the first three rows on your side. Once both players are satisfied with their setup, the battle commences. Turns are taken simultaneously with each commander giving their movement orders to all of their tanks. These are set by turning the dials on their control panels, dictating the direction of movement (one space, into any adjacent square) and whether or not the tank will rotate (the 2nd dial for each tank). These are kept hidden from one another until all have been selected. The boards are then set to the side for the moment. At this point commanders can fire their tanks by placing a shell with a matching sticker within the cone of fire for that vehicle. If unobstructed, a tank can shoot up to six squares straight ahead or within the diamond created by this furthest space and the current location. You may not shoot over other tanks or berms in either direction. 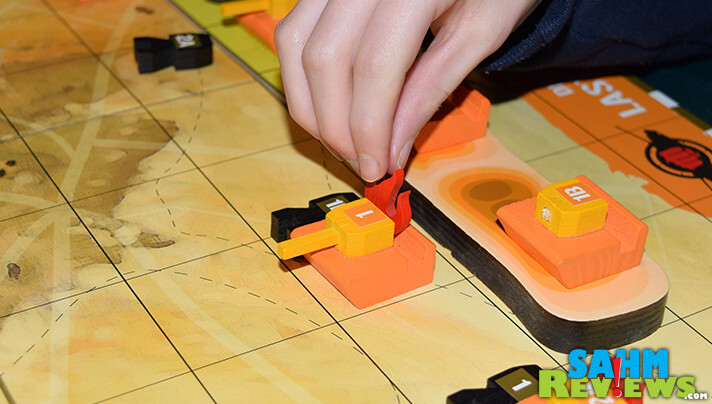 But you may move your tank onto a berm that will allow for further shooting (up to 7 squares)! Once all shells are placed, control panels are revealed and tanks move according to their previous orders. Each player moves their tanks with any moving into a space where enemy shells have been placed are hit. Tanks can take two shells, so if this is their first hit, place a wooden flame market in the slot on the back of the tank. If a second hit is received, that tank is disabled, the flame marker is moved to cover the tank’s insignia and it remains stationary for the rest of the game. If more than one tank tries to move into the same space, neither move at all. Additionally, tanks may not move in a manner where they trade spaces with another tank. 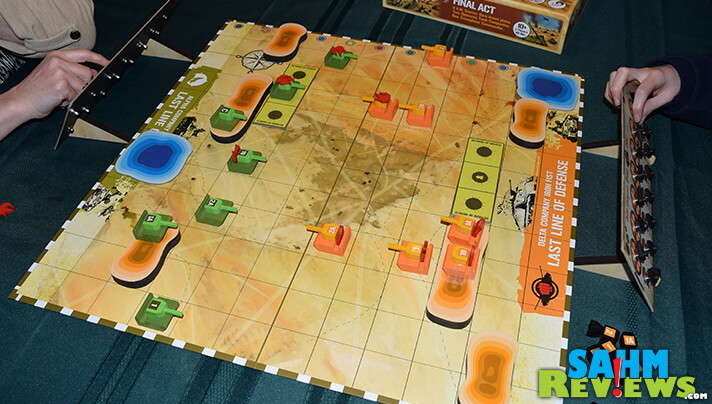 Multiple rounds are played until one commander maneuvers just one tank into the enemy’s last line of defense. The encroaching army is declared the winner of Final Act! 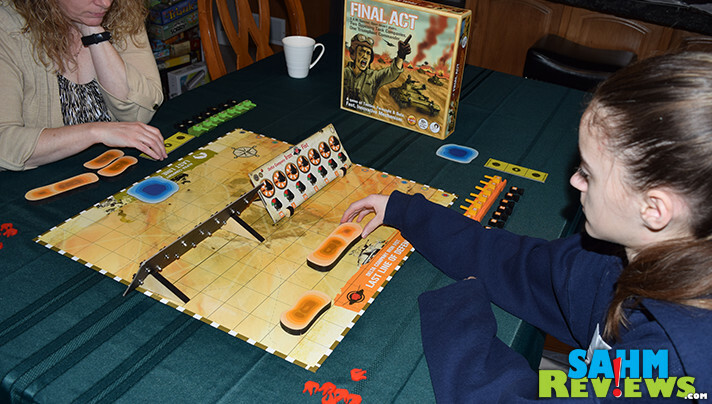 Thanks to the directional firing and limited cone area, you’ll need strong tactics in order to win at Final Act. Flanking, positional placement, patience and a little bit of luck will be needed to be successful. You’ll find yourself learning from your mistakes and trying new tactics every time you play! So there was one drawback to the exceptional component quality in Final Act. The tanks are assembled from multiple (small) pieces of wood and packaged into two burlap-like carrying bags. Because the turrets protrude from the tank, they seem easy to break. In our brand new box we received one tank that had come apart at the turret, which was easily glued back into place. However, a second tank didn’t fare as well. Not only was the turret completely broken off, it wasn’t in the box at all. Meaning, it was broken and packaged at the factory that way. A bit inconvenient since the turret is used to determine direction of fire. We’re searching for a solution to fix it ourselves, but nothing has looked just right. Considering the overall quality of Final Act, we’re surprised to find copies on Amazon for under $30! We would have expect it to retail for quite a bit higher. And while rated for ages 10+, we can envision it being enjoyed by kids as young as six or seven if an adult is present to explain the rules. 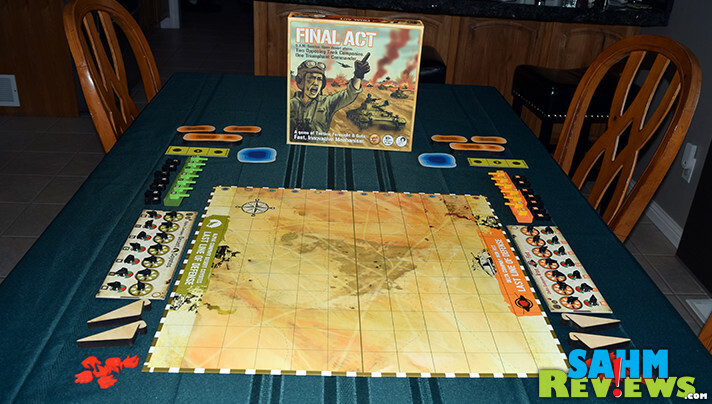 A great solution for introducing them to tactical war games, Final Act should be on your short list of games from this genre. 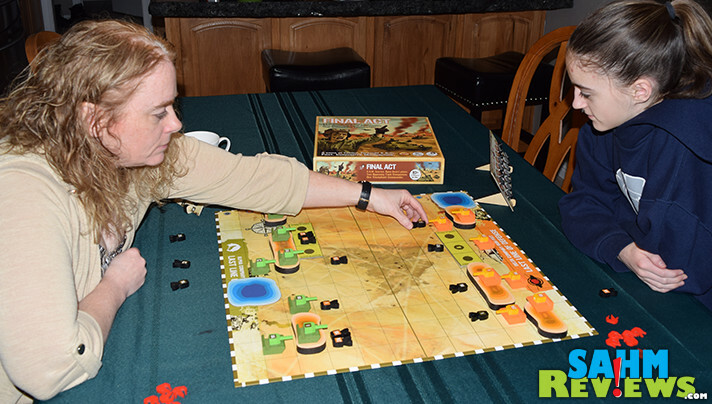 Do you have any war games in your collection? Sounds like a great option for kids who like war games. 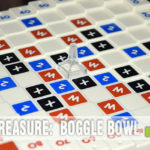 Too bad about the pieces breaking but hopefully the company can come up with a fix for that! I know my kids get A LOT of joy out of sinking each other’s battleships when we play Battleship. I know that they’ll love destroying tanks, even if that’s just one component of the game. Sounds like a fun genre to get into. My 8-year-old would love taking on her siblings (and possibly destroying them). 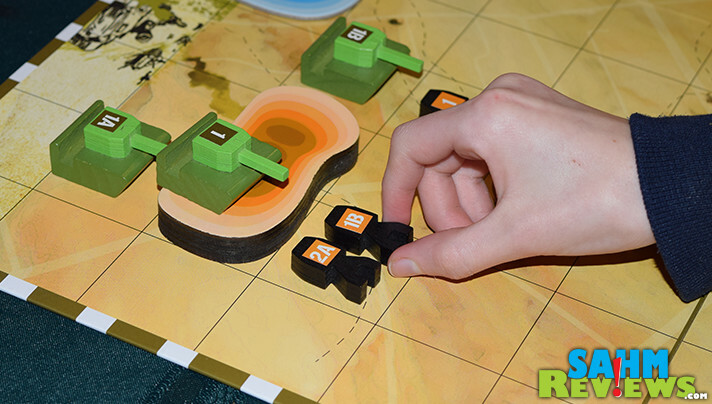 The tank pieces, although fragile, make a fun 3-D game play that my family would really enjoy. I like how you show the close ups for this game. I find that helps me when reading the directions for a game I haven not played before. 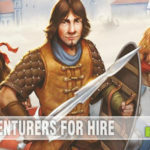 Looks like it is a great game to play. I love that it is ready right out of the box! That makes it so easy to get started. My son would love it.